As you can see in the video, our Los Angeles Footprints Writing Club members have appeared at various venues around Los Angeles, doing readings and book signings for eager buyers. Shown reading at UCLA, Moty Zahavi. To his right, Marie Stein, who had just read a story about relocating to America after the Holocaust, and the fact that though she was safe now, she was terribly lonely, having lost all family and loved ones except her husband. Back row, Eleanor Howard and Jacob Golan. Click the photo to contact Ina and learn more about booking appearances by our group, or setting up workshops for your own organization. Below are writers/performers preparing for a book and an upcoming event. We invite family, friends and the public to hear our students read from our latest compilation in the "Stories From The Heart" Series. Watch segments of the show here. You'll see funny, poignant and thought-provoking tales from a range of continents, and a range of times. 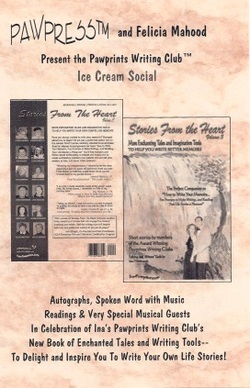 "Stories From The Heart Live Onstage"
You can read a story about our work here reported in "Not Born Yesterday." Stories 'n Schtick -- coming to you live, and in development for TV! Our concept grew from humorous yet poignant glimpses into early days in the lives of our writers. These tales are poignant, outrageous and warm. Now we've got an ongoing story for a TV series brewing as weird things happen to our fearless writers. Pictured left, featured performers in live shows we have performed. From left: Frank Boyd, Ina Hillebrandt, Laurel Shapiro, Christine Jordan, Moty Zahavi, Nicole Gratson (you can also see Nikki perched on the piano at the top of this page, going over notes from Ina during rehearsal for a taping. An intergenerational program designed to help break down barriers between "young whippersnappers" and "old fuddy duddies," this program succeeded beyond expectations in fostering mutual understanding, and breaking down those worn stereotypes. Younger folks found the "old people" were not falling apart and doddering, and benefited from having the seniors become mentors. The seniors in turn felt listened to and appreciated, a thing they had come not to expect from young people. This was very rewarding for them as well. PLEASE NOTE: If you would like to have us work with you to help improve communications among different generations in your community, please contact us. We would love to help you design our program to fit your members. It's a totally rewarding 5 week program, with opportunities to expand into an ongoing community-building series.